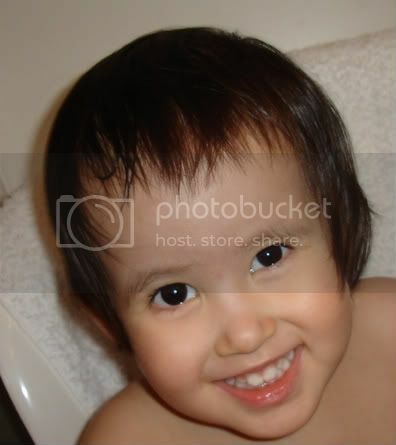 Across 2 Cultures - Cross-Culture Parenting and Lifestyle Blog: Isn't she pretty? I am posting this picture because I just love her smile on it. It simply cheers me up to see this face. Sometimes it baffles me how her little mind works. When she was having dinner last night, she mentioned that her bowl is broken. I explained to her that it was her plate that was broken and it broke because she was rough with it. And I told her I threw it away. Then she asked me, "why was she rough with it? Why did Laetitia do that?" I looked at her and said, "you will have to answer that." And she turned to me and said, no, "you", pointing to me "are Laetitia, I am Mummy. Why did you break the plate?". Errrrr..... I just burst out laughing. Silly thing.